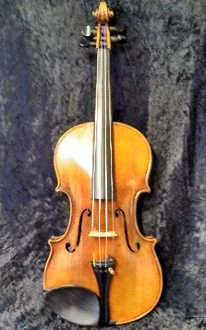 This full size Guarnari copy violin for sale was made by the Alfred Moritz factory in Dresden, GERMANY in 1888. Moritz operated a top factory by employing highly skilled workers to make his violins. This violin is an Excelsior violin, which was extremely popular in England at the turn of the century. It is a Conservatory grade violin, as evidenced by the Conservatory stamp in the scroll. It has a very nice two piece back with a tight curl and attractive flame. The varnish is a nice "span itemprop="color">golden-orange color, which is a bit darker than many Moritz violins. The sound is warm and smooth, with nice clarity from all the strings. It has no repairs but it does have a cosmetic varnish blemish on the top left side; it appears as if at some point a small portion of the varnish overheated. This does not affect the quality of the Moritz Excelsior Violin. Priced at $2600.00, an advancing high school student would enjoy playing this violin.